Since I received my Ugandan pilot license, life has been full and many things have happened. I've been busy flying and the hours and stories are beginning to pile up. The problem now is just finding the time to put it all down on this digital paper. There has been a plane in the mud, a snake in the grass, and a shortening of an airstrip. What to write first? Well, since all of this happened on the same flight, I'll start with that one. Bundibugyo. This is the name of the little village on the western side of Uganda that I wrote about previously in my post, "Spidey Senses". This airstrip is one of our more challenging ones, and because of it's location and proximity to the mountains it seems as though every time I go in there I come out with a new story to tell. In this particular instance I contacted the missionaries who live there the night before to find out the condition of the airstrip. The response was not encouraging. Four of the previous five days had been rainy. This airstrip gets wet and soft after only one day of rain, so with four days of heavy rain there was much doubt in our minds as to whether or not I would even attempt the flight on the following day. I have to say that I slept well that night. I awoke the next morning and prepared for my flight, not knowing if I would actually fly or not. I made the short walk up to the office and after some discussion, I tossed my flight bag into the vehicle and made my way out to the airfield. After completing my pre-flight inspections, I made another call back to ops for the latest word on the Budibugyo airstrip. The word was slightly more encouraging. After driving up and down the airstrip that morning, the news was that the rainless night had allowed for some improvement of the airstrip. The cloudless morning was also working in our favor, and the sun was already beginning to dry the strip out further. With the new information in hand I loaded my passenger up, climbed into my plane and launched into the clear blue sky. As with the previous time that I had flown to Bundibugyo, the weather as I approached the mountains got progressively worse. This time, going over the clouds and the mountains was not an option and I was forced below the clouds. This also put me below the mountaintops and I once again put my plane into the MAF mountain flying configuration. As we got nearer to the mountains, one small saddle in the ridge line became visible in front of us. Both peaks on either side of the saddle were covered in cloud, and the only hole across the mountains was through the saddle. Once again, I could clearly see over to the other side, and the weather there was clear and bright. I was aware as we approached the ridge line of my passenger glancing uncomfortably in my direction. I could almost hear his thoughts of, "Is this guy actually going to fly us through that small hole?" I smiled inside. I've done ridge crossings like this many times in the past, and although this would be one of the first times where the clouds were real rather than fictional, the scenario was textbook. There was plenty of room to turn around if we needed to, we had plenty of altitude, and we were certain of the weather on the other side of the ridge. We popped over the ridge and almost immediately into the sunshine on the other side of the mountains. As we had come over almost directly above the airstrip, we had several minutes of circling over head as we descended down to the airstrip. The missionaries on the ground beneath us had determined that the low area of the airstrip was too wet and soft for me to go through and had placed high visibility triangles across the runway at that point, effectively shortening the length of the runway. Although the extra length was still there, it was not useable. I did a few quick calculations, and found that I would still be easily able to land and come to a safe stop in the space provided. I must confess that I wasn't 100% confident that I would be able to take off again in the space provided. They say that with flying it is better to be on the ground wishing that you were flying than in the air wishing that you were on the ground. I was reasonably certain that I would be able to take off again, but if not I was also willing to wait until the conditions improved enough for me to do so safely. Once again I did a low pass down the airstrip, taking a good, close look at the conditions before committing myself to landing. The area that was marked out looked very adequate for landing, so I prepared the plane, prepared myself, and brought the plane down to the earth. I touched down very near the end of the airstrip and immediately felt the combination of the soft earth and calf length grass slowing me down. Adding a little braking brought me to a swift and short stop. Because the airstrip got progressively worse further down the runway, I brought the plane to an immediate stop and did not taxi any further, choosing instead to shut the engine down where I stopped rather than to taxi further and find myself stuck in the mud. One of the first things that I heard from one of the missionaries there was, "Great job! I've never seen any plane land that short before!" Although the soft earth and the tall grass had a lot to do with it, I have to say that the expressed sentiment still felt good. Now that I was on the ground, I turned my attention to getting back off of it. Firstly, I walked the remaining area in front of my plane, trying to determine how much further I could taxi and how much of the remaining runway was firm enough for me to use. I ended up agreeing with the missionaries initial assessment, that I could taxi up to the markers safely and use that area to turn around and begin my take-off roll. Although I had just used the area for landing, I next walked the area behind the airplane. This was for two reasons; I wanted to have a look at the condition of the airstrip and feel the softness of the earth beneath my feet, and I also wanted to pace off the length of the available runway so that I knew precisely how much space I had to work with. The Snake. The yellow is the belly. I'd guess 7 feet long. As I walked the airstrip with Michael (one of the missionaries there), we simultaneously came to a sudden halt. 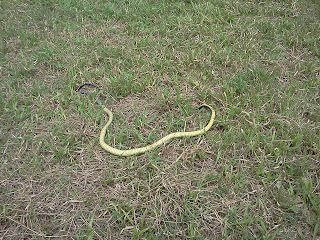 There in front of us in the grass was a rather large snake. It only took us a second before we realized that it was already dead, but I have to say that the one second was all it took for my adrenaline to kick into high gear. Once we realized that it was dead we took a closer look. 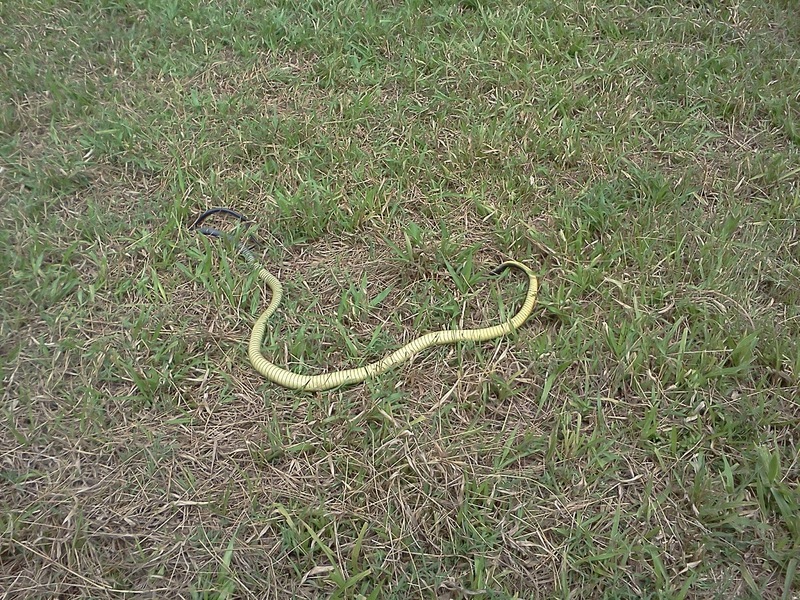 This was one of the first snakes that I'd seen here in Uganda, and it was a big one. I'd guess the length of the thing to be somewhere between 6 or 7 feet long, and it was around 4 inches think in the middle. Neither of us knew what kind of snake it was, although we both thought that it was some kind of cobra. Ugghh. I'm nothing like Indiana Jones, but when it comes to snakes we are two peas in a pod. I hate snakes. I did take a picture for posterity, though. Nasty. It was only after I took off again that I considered I may have killed it when I landed, but I really don't know. I was very glad that it was dead when we saw it and that we didn't have to deal with a live sake of that size. After pacing off the length of the useable runway, I had to do some more math. We have very specific criteria that must be met before we are allowed to take-off of an airstrip. The criteria takes into account the weight of the aircraft, the altitude of the airstrip, airstrip length, obstacles on the departure path and more. After doing the calculations I was certain that I would have no problems taking off of the available runway. I took the time to mark both where I thought my wheels would lift off, as well as marking my abort point. If things went wrong on the take-off roll, I wanted to be sure to have enough time to safely abort the take-off. I had no passengers to wait for, so I climbed into the plane, started up and carefully taxied to the area marked out as the end of useable runway. I had to be careful as I taxied, as the useable runway there was considerably more narrow than normal due to the very soft areas near the edge of the runway. I had made a mental note of where the firm area was, and as I advanced the throttle and added power I did my best to take a line that took me over the most firm area. I felt the power flow through the airframe and the propeller bite into the air, and the airplane begin to speed up. Suddenly, I felt the right main wheel sink into the mud and the airplane began to slow down and pull sideways. As the power was already at maximum, this time there was no way to add more throttle and simply power through the problem. Also, the mud was pulling me more and more quickly towards the edge of the airstrip. The sideways movement of the airplane brought the nose wheel off of the firm ground and I felt the nose wheel sink into the mud. As I felt and saw the nose sink into the mud, I immediately brought the power to idle and shut down the engine. In the few seconds that it took for the prop to stop spinning, I held my breath, fearful that with every further revolution the propeller might make contact with the ground. If that happened, I wouldn't be going anywhere for a long time. In the case of a prop strike, the engine would likely have to be torn down and inspected for damage, and a new propeller installed. I opened my door and walked around the cowling to look at my prop. There was no curling on the prop tips, and they didn't have any dirt staining or green colouring from turning through the grass. I looked down at the ground for any evidence of the prop slicing through the dirt, and all that I saw was that there was about a two foot section of grass that had been neatly trimmed by my propeller. I had come within about 3 or 4 inches of hitting my propeller on the ground. I breathed a quick prayer of thanks and turned my attention to getting unstuck. The right main wheel and nose wheel were both almost sunk to the top of the wheels. By this time Michael had rejoined me at the airplane and he headed up the airstrip to get his vehicle. Several of the soldiers who were guarding the airstrip also made their way down and joined me in digging at the mud around the wheels with our bare hands. It was soft enough that we had no trouble clearing the muck from around the wheels. Initially we attempted to push the airplane out by hand, but our rocking of the plane only managed to sink the wheels further into the mud. Michael backed his Toyota up to the plane and we pulled out his tow cable (everyone has one here). Slowly, carefully, we eased the plane out of the mud with a combination of pulling with the vehicle and pushing with manpower. As soon as we were unstuck enough we unhooked the tow rope and pushed the plane the rest of the way out using manpower alone. Once again I ran the numbers. With the remaining runway there was much less margin for error, but it was still within what is allowed. Once again I climbed into my aircraft, started up the engine, and advanced the throttle. My wheels lifted off of the ground even earlier than I had calculated, and as I climbed over the trees and turned on course I was thankful that I wasn't carrying any passengers on the return flight. There was more to be thankful for as well, thankful that I was able to safely land, thankful that nothing worse happened than briefly getting stuck in the mud, and thankful that I was going to be sleeping in my own bed again on that night. Thanks once again for your prayers and support. You are a critical part of our ministry here in Uganda. Wow! The Corb Lund band should write a song about you called "Plane Got Stuck". We got our truck stuck the other day in the snow and I was thinking of their "Truck Got Stuck" song. You must have felt pretty good when you were back in the air after that.